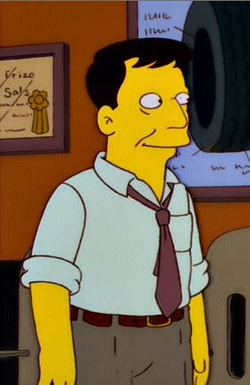 Wally Kogen is a travel agent who takes Homer Simpson and his friends to the Super Bowl. He and Homer first met in a pyramid scheme and later met while Homer was waiting to get his car tires replaced. Wally is a travel agent who is often tricked into buying things. He once went into a tire store to use the phone and was tricked into buying their "Road King Package". He also bought counterfeit Super Bowl tickets, which were printed on crackers. He also knows Dolly Parton and got her to help him and his friends break out of jail. He was seen during Trappuccino. Modified on December 19, 2017, at 08:15.